In a meeting with Timor Leste’s out-going Ambassador to Vietnam Jorge Trindade Neves De Camoes in Hanoi on December 15, the President affirmed Vietnam always attaches importance to boosting relations with Timor Leste in both bilateral and multilateral cooperation structure. Highlighting the great potential for the two nations to bolster connection, President Quang stressed the two sides need maintain the exchange of all-level visits and promote people-to-people exchange, thus strengthening mutual understanding and trust as well as expanding collaboration. He asked the Timor Leste side to complete internal procedures, towards enabling the bilateral Trade Agreement between the two countries signed in 2013 to take effect as soon as possible. The President also called on Timor Leste to continue creating favourable conditions for Viettel Group to effectively operate in the country. For his part, Jorge Trindade Neves De Camoes thanked the Vietnamese State for its support for Timor Leste in recent years, expressing his hope that Vietnam will back Timor Leste’s bid for membership of the Association of Southeast Asian Nations (ASEAN). Timor Leste hopes for more effective coordination between the two countries in the coming time, towards creating new progresses in their bilateral cooperation, he stressed. 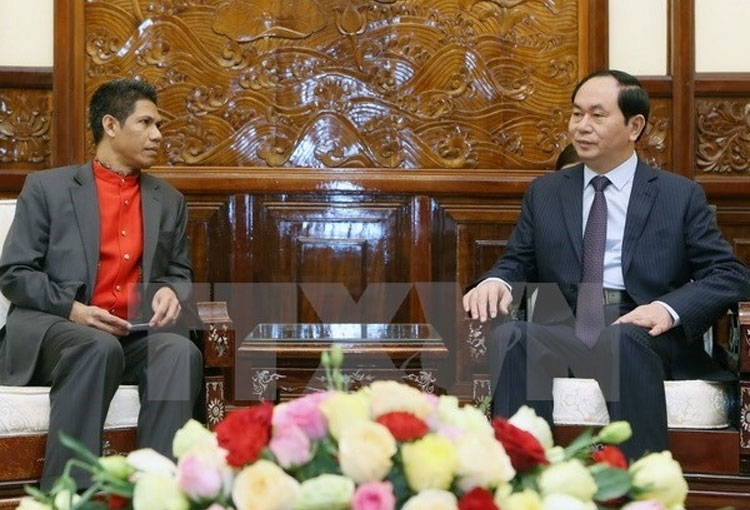 The diplomat affirmed that his country’s policy to promote people-to-people exchange with Vietnam, and encourage Vietnamese enterprises to invest in the country, especially in telecommunications. He took the occasion to convey to Presdent Tran Dai Quang an invitation to visit Timor Leste from President Taur Matan Ruak. President Quang accepted the invitation with pleasure.